Best Western Royal Hotel is located in St Helier, Jersey just a few minutes walk from St Helier town centre. An attractive and comfortable hotel with 89 en-suite hotel rooms which include suites and romantic four poster bedrooms. Free Wi-Fi, mini-gym and a free car park with 16 spaces are available for guests. Monterey Hotel is located in St Helier town centre. Guests can enjoy the use of a luxury indoor heated swimming pool, steam room, hot tub and mini gym, restaurant and bar. There is also a large outdoor swimming pool available in the warmer Summer months. The hotel has free parking for hotel guests (approx. 40 cars) and is on Jersey's bus route so exploring Jersey is very easy even if you don't have a car. Longueville Manor in Jersey is a highly acclaimed 5 star luxury boutique hotel with 30 luxury bedrooms and suites, located east of St Helier on A3 (Longueville Road) towards Gorey. Awarded AA Five Red Stars 2012, AA Three Rosettes 2012 & TripAdvisor - "25 Best UK Hotels" 2012. Set in 16 acres with swimming pool and all weather tennis court. Longueville Manor is ideal for romantic holidays or wedding reception. Runnymede Court Hotel is a well established 2 star hotel which prides itself on high standards of English cuisine, quality service and comfortable surroundings which is why many guests return year after year. Hotel Cristina is a 4 star hotel in a peaceful hillside location offering one of the finest views in Jersey. Overlooking St Aubin's Bay, Elizabeth Castle and St Aubin's Fort, Hotel Cristina is ideally situated for walking and cycling. Only one and a half miles from St Helier, St Aubin's Bay is just a few minutes walk through Coronation Park. 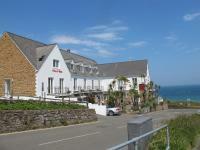 The Prince of Wales Hotel has fantastic sea views over Grève de Lecq, an idyllic sandy bay. Nearby cliff walks have views of Sark and the French coast. Bus stop nearby. Free parking. Free Wi-Fi for hotel guests. En-suite bedrooms, some with private patio and sea view. Families are welcome. Relax on the sun terrace, garden and TV lounge. Popular hotel restaurant. Fully licensed bar. 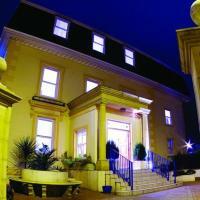 Old Bank House is a 2 star hotel situated on the fringe of the picturesque Gorey Village in Jersey. Small but comfortable and modernised, Old Bank House Hotel provides an ideal base for a holiday in Jersey. The hotel offers 20 en-suite bedrooms which are comfortably furnished and well equipped. The Old Bank House Tea Garden is open daily from 11 a.M., April to October, serving afternoon teas and a delicious selection of cakes and sandwiches. Grand Jersey is a luxury 5 star hotel in St Helier with views over St Aubin's Bay and Elizabeth Castle and just 15 minutes from the airport and 10 minutes from St Helier. The Grand Jersey Hotel in Jersey has an exciting and innovative look and feel, combining wonderful architecture with contemporary design. Mornington Hotel located opposite Howard Davis Park. St Helier town centre & beach at Havre des Pas short 5 minute walk. St Helier's marina 1 mile & Mont Orgueil Castle 15 minutes drive. Restaurants nearby. Free private parking available at rear of hotel. Free Wi-Fi in Reception. Guests bar & TV lounge. Ensuite rooms, HD flat screen TV, tea & coffee making facilities, wired Internet. Rooms accessible by lift. Mayfair Hotel in Jersey is conveniently located, 10 minutes walk from St Helier town centre, bus station, Elizabeth Castle and beach. Mayfair Hotel Health Club is free to guests staying at the hotel and has an indoor heated swimming pool with Jacuzzi, steam room and gym. Families are welcome. Mayfair Hotel Restaurant serves delicious dishes. Limited free parking is available. Free Wi-Fi in reception area. The small family run Dolphin Hotel is located on the east side of Jersey in St Martins, overlooking the harbour and Grouville Bay. The famous Mont Orgueil Castle is just a ten minute walk away from the Dolphin Hotel. Open all year round, the friendly hotel offers en-suite bedrooms, many with sea views, and several Premier bedrooms with panoramic views across the harbour. Hotel La Place centres on a 17th century Jersey farmhouse in the heart of Jersey's 'Green Lanes' network, making it the ideal hotel for walkers and cyclists. This location in St Brelade is one of the most beautiful and peaceful parts of Jersey. Hotel La Place offers four styles of bedrooms, from pool-side rooms with a private terrace to elegant four-poster bedrooms with whirlpool baths. 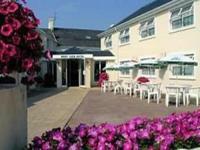 The Oaklands Lodge Hotel is a small, modern hotel, 1 mile north of St Helier on Trinity Hill. 5 minute drive from St Helier town centre. Bus stop nearby. 40 minutes to walk to St Helier. Large car park. Lounge and large sun patio. Excellent food at the Blacksmiths Arms and Red Rose Restaurant so book your table early! Hotel only has 2 floors and no lift. The Inn Jersey is a new and modern, vibrant retreat on the outskirts of St Helier, within easy reach of the beaches, shops and restaurants. 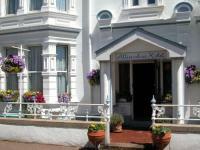 The Norfolk Lodge Hotel is an easy 15 minutes walk from St Helier town centre (0.5 mile from town shops) and beaches. Free on-site parking, bus stop nearby, bicycle racks. Families are welcome and young children can play in the purpose built playroom. Superb indoor swimming pool complex (and children's pool), large lounge areas with free Wi-Fi access and elevated sun terrace. The restaurant serves an "all day menu". The Golden Sands Hotel is a 4 star family hotel right on the beach of St Brelade's Bay, one of the best beaches on Jersey. The relaxed, friendly atmosphere and excellent location make the Golden Sands Hotel in Jersey an ideal base for a family holiday. Room types include: Standard, Superior Sea View Rooms, Superior Family Inland Rooms & family rooms, with superb views and most are south-facing and have balconies.